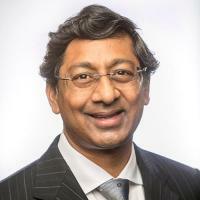 Ravi Bellamkonda is the Vinik Dean of the Pratt School of Engineering at Duke University. Prior to becoming dean, Bellamkonda served as the Wallace H. Coulter Professor and chair of the Department of Biomedical Engineering at Georgia Institute of Technology and Emory University. He is committed to fostering transformative research and pedagogical innovation as well as programs that create an entrepreneurial mindset amongst faculty and students. A trained bioengineer and neuroscientist, Bellamkonda holds an undergraduate degree in biomedical engineering. His graduate training at Brown University was in biomaterials and medical science (with Patrick Aebischer), and his post-doctoral training at Massachusetts Institute of Technology focused on the molecular mechanisms of axon guidance and neural development (with Jerry Schneider and Sonal Jhaveri). His current research explores the interplay of biomaterials and the nervous system for neural interfaces, nerve repair and brain tumor therapy. From 2014 to 2016, Bellamkonda served as president of the American Institute for Biological and Medical Engineering (AIMBE), the leading policy and advocacy organization for biomedical engineers with representation from industry, academia and government. Bellamkonda’s numerous awards include the Clemson Award for Applied Research from the Society for Biomaterials, EUREKA award from National Cancer Institute (National Institutes of Health), CAREER award from the National Science Foundation and Best Professor Award from the Georgia Tech Biomedical Engineering student body. Engineered devices for brain tumor therapy; immunomodulation for peripheral and central nervous system repair; biomaterials; brain-machine interfaces. Lyon, JG; Carroll, SL; Mokarram, N; Bellamkonda, RV, Electrotaxis of Glioblastoma and Medulloblastoma Spheroidal Aggregates., Scientific Reports, vol 9 no. 1 (2019) [10.1038/s41598-019-41505-6] [abs]. Saxena, T; Lyon, JG; Pai, SB; Pare, D; Amero, J; Karumbaiah, L; Carroll, SL; Gaupp, E; Bellamkonda, RV, Engineering Controlled Peritumoral Inflammation to Constrain Brain Tumor Growth., Advanced Healthcare Materials, vol 8 no. 4 (2019) [10.1002/adhm.201801076] [abs]. Krucoff, MO; Miller, JP; Saxena, T; Bellamkonda, R; Rahimpour, S; Harward, SC; Lad, SP; Turner, DA, Toward Functional Restoration of the Central Nervous System: A Review of Translational Neuroscience Principles., Neurosurgery, vol 84 no. 1 (2019), pp. 30-40 [10.1093/neuros/nyy128] [abs]. Loomis, KH; Lindsay, KE; Zurla, C; Bhosle, SM; Vanover, DA; Blanchard, EL; Kirschman, JL; Bellamkonda, RV; Santangelo, PJ, In Vitro Transcribed mRNA Vaccines with Programmable Stimulation of Innate Immunity., Bioconjugate Chemistry, vol 29 no. 9 (2018), pp. 3072-3083 [10.1021/acs.bioconjchem.8b00443] [abs]. Lee, Y; Pai, SB; Bellamkonda, RV; Thompson, DH; Singh, J, Cerivastatin Nanoliposome as a Potential Disease Modifying Approach for the Treatment of Pulmonary Arterial Hypertension., The Journal of Pharmacology and Experimental Therapeutics, vol 366 no. 1 (2018), pp. 66-74 [10.1124/jpet.118.247643] [abs].